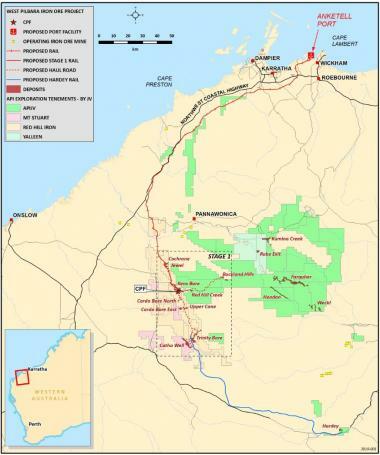 The West Pilbara Iron Ore Project ("WPIOP") is one of the largest independently owned undeveloped direct shipping iron ore projects in Australia and, once developed, will be a material contributor to seaborne iron ore supply. The project is a long-term staged project involving new mine, rail and port development. Current development is focussed on Stage 1 of the project, which is based on CID iron ore deposits located 30 km to 85 km south west of Pannawonica. In September 2015 an update to the Stage 1 Ore Reserve estimate was released, increasing the estimate to 780Mt (a 75% increase). The Ore Reserve estimate reflects a 72% conversion of the Measured and Indicated Stage 1 Mineral Resource, which was released in June 2015. There is potential for considerable further growth with a total JORC Resource of 2,686Mt across the extensive tenement portfolio in the Pilbara. Train unloading, iron ore stockpiles and ship loading facilities at the port location. Due largely to the prevailing iron ore market conditions, the project participants have decided to defer the previously targeted completion of a DFS by mid-2016, however, key project approvals and areas of potential value enhancement will continue to be pursued. WPIOP is developing an optimised mining and blending schedule for the Ore Reserves identified for the Stage 1 mine development. Ore will be mined from the ten Stage 1 deposits in relative shallow open pits at for four hubs:- North, Central, South and Buckland Hills. The mining methods will utilise proven open pit drill and blast, load and haul techniques. The Stage 1 infrastructure will be designed to facilitate blending operations, via a CPF, as proposed in the mining schedule. This CPF will primarily use conventional dry crushing and screening equipment to produce a consistent direct shipping West Pilbara Fines product throughout the life of the Stage 1 mine. Anketell Point has been identified by the WA State Government as a preferred location for new deep-water, bulk loading port for the Pilbara. 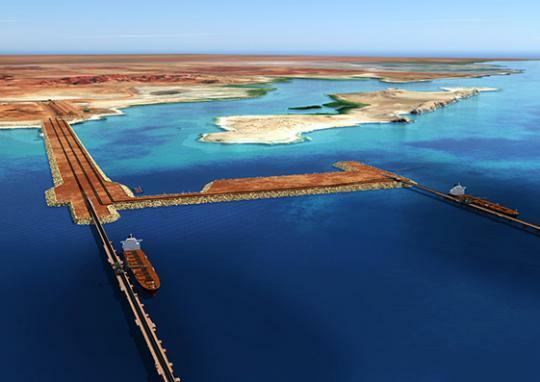 The initial development contemplates the construction of a 20km deep-water channel to allow capesize vessels up to 250,000dwt to depart the port fully laden. A causeway and jetty will be required to transport ore from the mainland to the ship loader. Stockpile facilities will enable the ore to be stored once unloaded from trains arriving via the 245km rail line, from the CPF at the mine site area. Train marshalling yards and maintenance facilities are also planned adjacent to the new port. 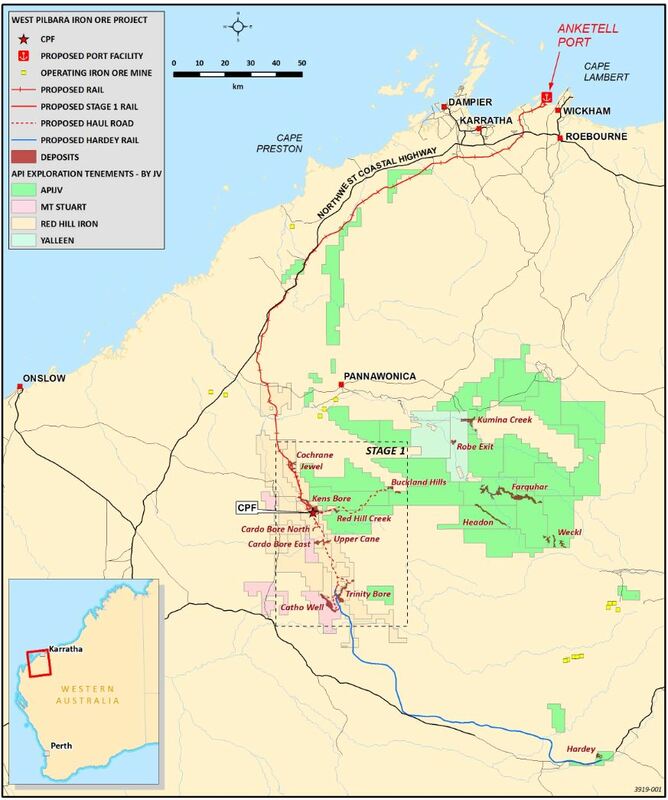 To enable the mine to produce at least 40Mtpa of iron ore fines, additional project infrastructure is required including an airstrip to provide Fly-In-Fly-Out personnel services, quality village accommodation, connection to the Dampier to Goldfields gas pipeline to provide supply to an on-site power station and a bore field to deliver both process and potable water. Heritage surveys are well advanced across the mine and rail.